Your Identity on the Dark Web: How Much is it Worth to Criminals? In late 2018 we saw the release of a massive amount of leaked credentials "dumps". These expertly-curated collections highlight the risk posed by credentials leaked from large organizations. Join this webinar to understand how even most novice threat actors have the access and ability to exploit billions of sensitive corporate credentials, and how this threat affects your organization. Cyber threat actors find a seemingly limitless supply of hacking tools and products in deep and dark web markets and forums. How far can an attacker go with a ready-made hacking tool that was bought on the dark web? Where would the attacker be from? And what are the most popular off-shelf hacking product these days? The cybercriminal economy is based on a global illicit industry that, although unregulated, has well defined regions, suppliers, distributors, consumers, innovators, and end-users. Join us for a qualitative view of cybercriminal hubs around the world - differentiating cultural and environmental factors, motivations, and what place each occupies in the cybercrime supply chain. Cybercriminals always strive to stay ahead of the curve. In this webinar, Alex Karlinsky will shed some light on the latest techniques they employ to stay under the radar of cyber security firms and law enforcement agencies. Gaming and criminality have gone hand in hand for centuries. From cheating in games of chance, through laundering money in cash-rich casinos, to grey market shark-lending, the gaming industry has historically been a hotbed of criminal activity. It is no surprise then that digital gaming, an industry that grossed over $100 billion in 2017, has also attracted the criminal underclass. Join us to learn how Fortnite, a game with over 125 million active players and revenues of hundreds of millions of dollars every month, has become a focal point for criminal activity in the deep and dark web. How could a smart cyber-threat intelligence prevent the hacking of a web-based crypto wallet that ended in a massive robbery of millions of dollars? Sixgill senior intelligence analyst Gilad Israeli looks at asset-based intelligence and its capability to lead to a cyber-attack prevention. As an example, Gilad will discuss how Sixgill exposed a cyber-attack prior to its execution and proved the capability of providing actionable intelligence. Cybercriminals are constantly on the prowl, and personal and corporate data is their favorite catch. Confidential information is being traded in darknet underground markets at any moment, even years after being compromised. Learn about the different ways in which the data is stolen, how cyber crooks monetize it, and steps you can take to be better protected. CEO and Co-Founder Avi Kasztan tells us why he launched Sixgill after seeing the continued growth of attacks stemming from the dark web. He discusses Threat Actor Analysis and automatic, real-time dark web monitoring. 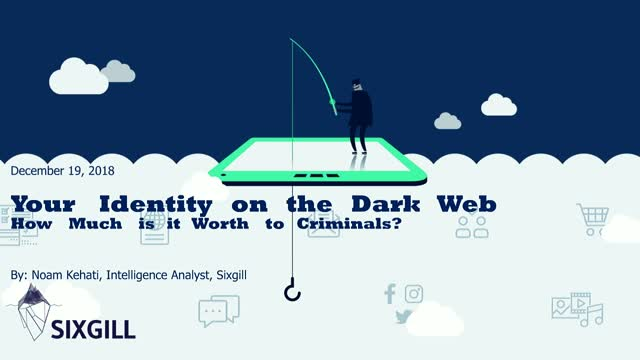 The Senior Cyber Intelligence Analyst at Sixgill, Gabriel Glusman, gives us a breakdown on the dark web vs the deep web and why the social media-like community on the dark web enables cyber attacks to thrive. Glusman then goes on to discuss the technology behind Dark-i and how it analyzes dark web activity to proactively combat cyber attacks. Threat intelligence is a critical factor in defending increasingly complex environments from sophisticated attacks. Join Sixgill and Forrester guest speaker Josh Zelonis for a fireside chat where we’ll explore how attackers are leveraging the deep and dark web, and how your organization can benefit from this type of intelligence. Sixgill is a cyber threat intelligence company that covertly and automatically analyzes Deep and Dark Web activity helping to detect and prevent cyber-attacks and sensitive data leaks before they occur. Utilizing advanced algorithms, Sixgill’s cyber intelligence platform provides organizations with continuous monitoring, prioritized real time alerts and actionable intelligence. Through advanced data mining and social profiling, Sixgill examines threat actors and their patterns of behavior, identifying and predicting cyber crime and terrorist activity. Title: Your Identity on the Dark Web: How Much is it Worth to Criminals?